Rate this Article Cheaters have always been a thorn and a scorn to every legit player that plays a game, any game. MMOFPS is no exception where hacks and scripts have allowed cheaters to ruin the game for all of us. Headshot Kill Yet No Skill as the saying goes. Since time immemorial there where always people who had this uncontrollable compunction to do anything including playing it dirty just to win. The thing is, they’re still here today and they manifest themselves in different forms especially in computer gaming. Back then, before the online world caught on, most early video games had game cheats pre-built into them that could be activated by obtaining cheat codes. This was a common practice but frowned upon if you really wanted to gain the skill in playing the game. Overtime, as multiplayer gaming and the emergence of LAN became popular, though still available in many a FPS game, cheat codes (mainly God mode) became the source of irritation and uproar among LAN players causing most of these to be removed in future game editions. Cheating is actually a Psychological disorder where the subject has this need to get even, then ahead of the rest even if it means being unfair. A cheater views life as unfair in the first place and believes he or she has been treated unfairly from birth and that the only way to win is to win dirty. Of course even normal people have the tendency to cheat but a real cheater is compulsive. It’s a habit, a trait and an addiction that may or may not affect everyday life but will usually ruin or downplay the meaning of being fair. How would you feel if somebody cuts-in the long line to get on the bus as it arrives and everyone has been waiting a while in-line. Likewise, how does he know you where hiding behind this wall and how come he gets you at one shot while he runs zigzag and jumps about with uncanny aim? Why… cheats of course. 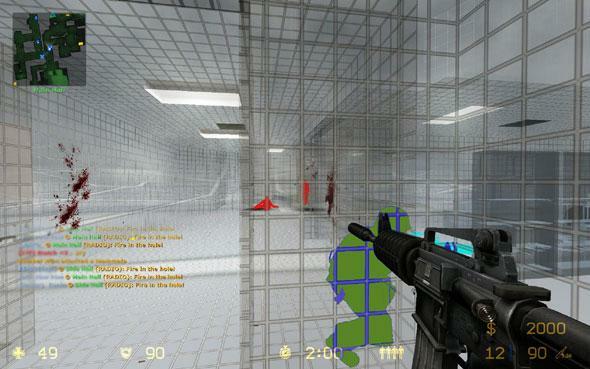 Since FPS game developers started fighting non-standard cheats (cheats that didn’t come with the game) from their game play, certain Hackers started writing scripts or small plug-in programs that undermined specific FPS games and unscrupulously sell these to those compulsive disorders who needed to get their “win” fix by the end of the game. Surprisingly, there is currently a very active market for this. At first, they aimed it at LAN games but as you know, LAN FPS is done in a controlled environment where the computers used can be checked for any irregularities. This is one of the main reasons why E-sports games are generally LAN games or played via LAN. It would be difficult for a Pro player to smuggle in a script without getting caught. The hackers and cheaters now turn to MMO gaming. When a player joins a server, practically nobody really knows what impurities reside within his computer and his gaming heart. Nobody can really tell till he starts playing with them, literally “playing” with them. FPS gaming is based on skill and learning it through time. Some will always be faster than others and of course others would age from children all the way to your GranDaddy who still can’t quit playing Doom since getting hooked way back in the 90’s. If you really can’t beat that 16 year old and you’re as young as Minh Le or Jesse Cliff, let it go. You’re playing to enjoy the game unless you’re aiming for E-sports. But why cheat? Young players likewise should swallow their pride and learn by the ropes if they’re really serious about it. It’s always better and much sweeter to take pride in something you worked for. FPS cheaters usually use an arsenal of scripts that they load with the game. Some of this are run simultaneously with the game client and some need modifications done to the client’s configuration files or game settings. There are 2 major types of cheats in MMOFPS which date back to the days of CounterStrike being played via LAN. Games like Battlefield, Call of Duty, Medal of Honor, Special Forces 2 and others have these in one way or the other. Aimbot, headshot kills no skill. These plug-ins if you will, will definitely give accurate aiming. Of course there is no guarantee that it will work all the time but usually the cheater will own the game. The script adjusts aim by employing several methods like using RGB colors for both team mates and opponents. Specific colors will be assigned to the enemy and the aimbot will search for that color and lock onto it. Another method is to employ Content Hacks. These scripts modify the graphic card settings within the game. It assigns colors to friend and foe then displays walls as transparent textures for a double wall hack effect and tracks enemy movement as he moves even if he is still out of sight. The aimbot usually auto fires when locked on a specific target (specifically the head) making sure that the target goes down. Wall Hack is when the script let’s the cheater see through walls and gives him time to take the necessary action against incoming opponents. There are several varieties of wall hacks but the most popular ones let you not only see through walls but let you fire and walk through them. So if you’re running through a tunnel with no one in sight and you suddenly get hit and go down or your opponent suddenly appears out of nowhere, chances are he’s wall hacking the game. There are other forms of cheat scripts like Radar and ESP that lets you detect and track enemies as they run through the map. Game publishers have taken steps to detect and shut down these cheaters by employing anti-cheats like VAC and PB while gaming communities encourage members to limit their play within the community to avoid cheaters who roam the public servers to get their fix. Community server admins keep these cheaters out to protect its members but every now and then they still get through and have to be dealt with. Or to take arms with scripts against a SEA of Pro players. To get hit, to die, to respawn once again and die again. Must be given pause: there is respect.